Verbena are creeping, soft perennial plants native to Eastern North America. With blooms from early spring until frost, they offer a lot of color for landscape and pot culture. Our varieties are all winter-hardy to some degree (especially homestead purple). We've selected improved and new varieties that bloom early and hold flowers longer. 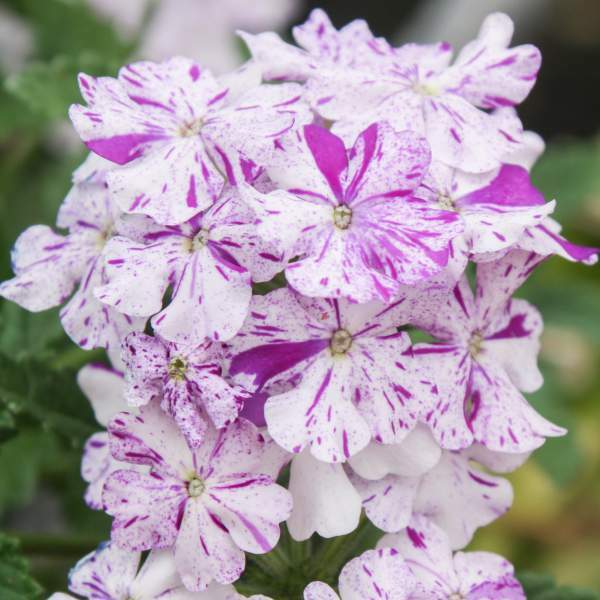 These are very fast-growing plants and will not disappoint your spring sales program. Grow them in hanging baskets or combination planters. For best results with Verbena, we recommend using a constant feed program of 150-200 ppm N. Maintain a pH between 5.8 - 6.2. Verbena can not tolerate overcrowding with poor air circulation. Space pots adequately to allow for light penetration and airflow between foliage of adjacent pots. We recommend 7-10 inches for 4” pots and 18-24 inches for 10” pots. Maintaining high light level and proper pinching are the best way to control height. An initial pinch is recommended, but additional pinching may be necessary to shape your final product. Growth can also be controlled using lower temperatures to encourage shorter lengths between internodes. Whiteflies, aphids, and thrips are the biggest pest problems with Verbena. Powdery mildew can be a problem with Verbena. To avoid it apply broad-spectrum, protective, fungicides when conditions are conducive for disease development. A rotation of Daconil ULTREX and Mural or Heritage fungicide in rotation with a myclobutanil chemical such as Eagle or Hoist will help control the disease. Also watch for botrytis while the days are short. This grey rot is usually associated with wet or humid conditions. You can prevent botrytis by allowing the plant to dry out between waterings, allowing for good airflow in your greenhouse, and spacing to allow the sun to penetrate to the soil level. The most common chemicals used to treat botrytis are Medallion and Banrot. Use them as a drench according to each label’s instructions.